At this point the number of platforms Skyrim has been ported over to has become a well-worn joke, so when The Elder Scrolls: Blades was first announced at this year’s E3, you could be forgiven for those exasperated sighs of “oh, so it’s Skyrim…on mobile”. But no, we’ve been assured by developer Bethesda that Blades is its own entity within the Elder Scrolls universe, filling a very different role to any Elder Scrolls game before. So, with the world on tenterhooks for any snippet of information related to The Elder Scrolls 6, will Blades manage to fill that void of new TES content, or will fans feel let down by a slimmed-down experience? We got hands-on with the demo at this year’s Gamescom, and spoke to Bethesda Softworks vice-president Pete Hines to find out more. The first thing you’ll notice when you get hold of Blades is the astounding console-level graphical fidelity of the game. Bethesda had an iPhone X set up for us to play on, and the level of quality crammed onto the phone’s admittedly excellent screen was phenomenal. The demo was only a short experience, but it allowed us to take a brief jaunt through the forests in search of enemies to slay, and gold to plunder for our town’s coffers. If you’re looking for the refreshing new take on the Elder Scrolls universe that comes with every new major title, you probably are going to be a bit let down. Aesthetically Blades felt very reminiscent of Skyrim, with the design of some enemies seemingly transferred from that game to Blades. In particular, we came across several of the iconic large forest spiders from Skyrim’s frosty woodland areas – so arachnophobes beware. According to Hines this was a conscious decision, but one he feels doesn’t detract from Blades’ unique identity. It really does look great. Hines even told a tale of an E3 attendee who began searching behind the scenes and under desks, as they thought the game was being run on a hidden PC and streamed to the phone somehow. Instead of the wide-open world of previous Elder Scrolls titles, Blades is a very linear experience, with your character moving down a path set out in front of them. You look around by directing the camera with your finger, and move by tapping the path in front of you. We couldn't help stopping along the woodland trail several times to scroll our camera around the screen and get a good look at the forest before us. The scenery was exceptionally well-realized, and triggered memories of the Reach region within Skyrim. Annoyingly, the camera reset to its 90-degree standard position every time we moved, which was slightly jarring, but the movement experience was still fairly intuitive, despite us occasionally ending up stuck behind a rock or tree and having to backtrack. Beyond the beautiful backdrop, the combat is where Blades shone through. 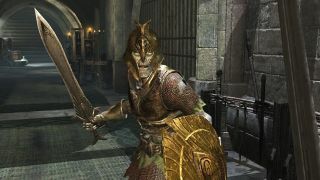 Past Elder Scrolls games have been criticized for their simplistic combat systems, which essentially boil down to ‘spam the attack button and occasionally hold up a shield if you feel like it’ – but we never appreciated how well this easy-to-use concept would lend itself to fights on a touchscreen. You have the choice of either swishing your weapon around with your scroll finger, or tapping and holding the screen to attack. Your shield is raised by holding a button on the left of the screen, and your array of spells are displayed along the bottom – also activated at the push of a button. We played in landscape mode, so holding the phone with two hands, with one charging an attack and the other ready to block a choreographed enemy attack, felt incredibly fluid and satisfying. It’s so approachable that it's tough to believe Hines when he tells us how tricky the system was to develop. While we were using a pre-made build and didn’t get to create our character, it was a pleasant surprise opening up the inventory screen to see an Oblivion-esque style to the menu, where we could check out our character decked out in all his gear. We tried out the iron, elven and daedric armor styles at our disposal, and when we were satisfied that we looked suitably badass, we went to carve up some goblins for their sweet loot. Unfortunately, we didn’t have the opportunity at Gamescom to try out the other main feature Blades has to offer: base building. The basic premise here is that your character’s town has been destroyed while you’ve been off adventuring, so it's up to you to rebuild from the ground up. Listening to Hines talk about the feature, it looks to be less Fallout 4 base-building, and more of a traditional mobile experience. We can’t wait to see how it’s all realized. So far Blades is a thoroughly enjoyable experience. Long-time Elder Scrolls fans will have to temper their expectations if they were hoping to experience a fully-realized open-world version of Bethesda’s fantasy universe. But compare the game to others in the mobile marketplace, and it looks certain to raise the bar in terms of what we should expect from phone-based gaming, even if we have lost the ability to Fus Ro Da a dragon in the face. The Elder Scrolls: Blades will release later this year.